Crafty, holiday lovin', diy blog! I guess it's about time I join the chalkboard craze! Have a look at the hideous specimen below. but this mirror is all wrong. the entire mirror, glass and all. I used Krylon brand in a satin finish. Once dry I gave the glass 3 coats of chalkboard paint, letting dry between coats of course. I just used a small craft paint brush about 1/2" wide. And voila, just like magic you end up with this beauty. I didn't spray paint the back since it will not be visible. I cut out dark grey felt and attached to the back with hot glue. As well the magnets are attached with hot glue. This baby is going on my refrigerator door. Now it's easy to write quick notes and even a grocery list. So cute! I love the white with the chalkboard center. 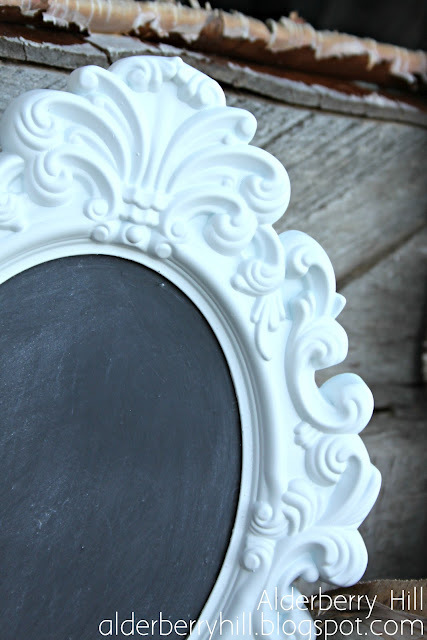 It's so clean and simple, but the ornate design on the mirror keeps it fun and pretty. Great idea! I know what you mean about joining the craze. We made chalk board signs for my daughter's wedding. One of these days I will get that blog post done. Since I used metal trays, I turned the magnet signs into magnet boards and am using them in my office. Your framed chalk board sign looks fabulous. Thanks for sharing. Great job updating it to fit you! I love how it turned out! Thanks for sharing at the Pomp Party! Pinning! I totally didn't think of putting magnets on the back to make it magnetic. I thought people were doing a goat of that magnetic paint with a coat of chalkboard paint over it. Good stuff! I wondered over from Whipperberry. I love it!! So pretty! Hey girl, thanks for joining in on the Friday Chaos blog party! So glad you linked up with us, and I get to follow you! Wahoo! I am loving his frame. Love it!! It turned out great! Wow that looks awesome, we have a picture frame like that from IKEA and I never know what to put in it!! I am a new follower from the blog hop till you drop! If you get a chance check out my blog please! Soooo cool! the frame looks so nice and chic! This is too cool! Great idea! Newest GFC follower from the weekend blog hop. Would love it if you could visit my humorous blog site and follow back via GFC! Thanks again for sharing! I have three of these sitting in my daughters room, and I never thought to spray paint them! I bought two white and one blue, and I love the colors but I hate how shiny and glossy they are. Spray paint is an awesome idea to lower the "gloss". Thank you so much for sharing with us at the link party! Absolutely gorgeous! Is there anything else that needs to be said? Oh, how bout this... STUNNING!!! That is super cute! I need to make some of these for my fridge! I love this. I need to make it now!!! New follower here from the blog hop!! Beautiful! Great idea to add magnets to it. What a cute idea! I love the magnet idea! Visiting from the Weekend Blog Walk. What a fantastic idea! love it! Found you on the FB page hop. What a great craft for groups too! That is way cool! Super neat! I might make this for a friend of mine! 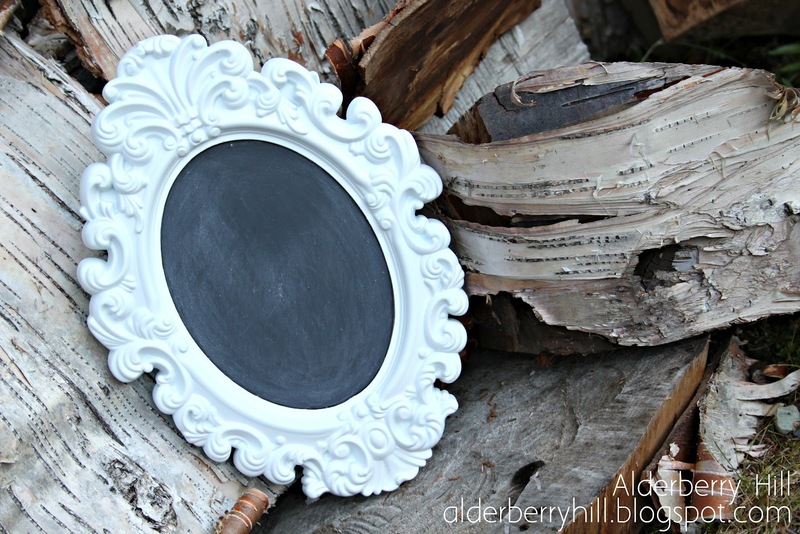 I'm with you - I love chalkboard paint and want to try it real soon! I love your project! 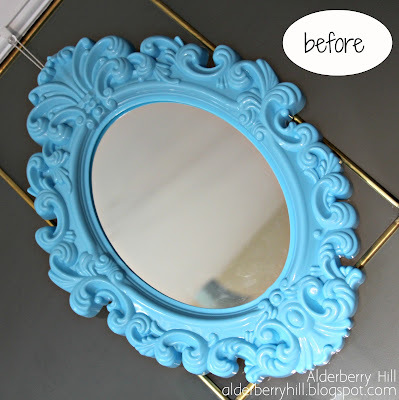 What a great way to transform the mirror--and yes, it did look rather horrendous before! What a great idea! Thanks for the great pictures.... I may have to give that a try. So adorable! Thanks for linking up to my party! What a fun transformation. 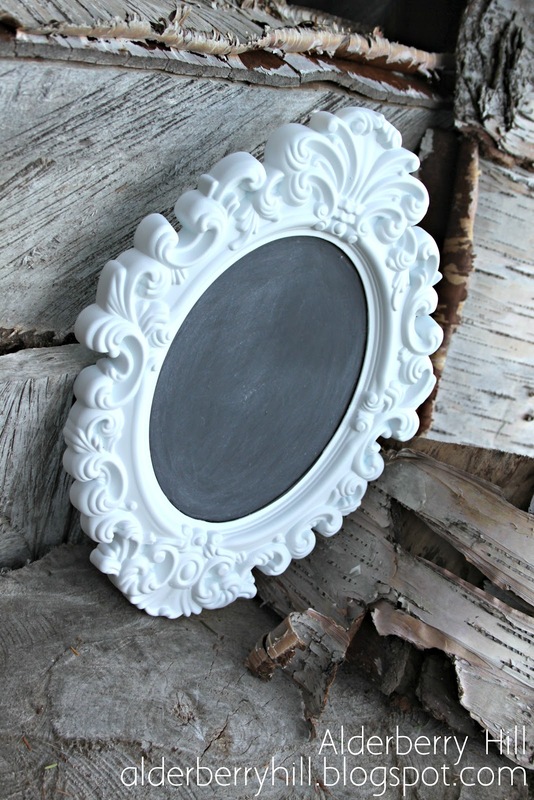 I like the way you just used the existing mirror as the chalkboard...no need to cut a separate piece! Love this! New follower from hop...happy to be here! One freakin good lookin mirror. It was meant to be white and chalkboard. Thanks for sharing your creative inspiration with Sunday’s Best – you helped make the party a success! Great make-over. Thanks for linking up at Shabbilicious Friday. 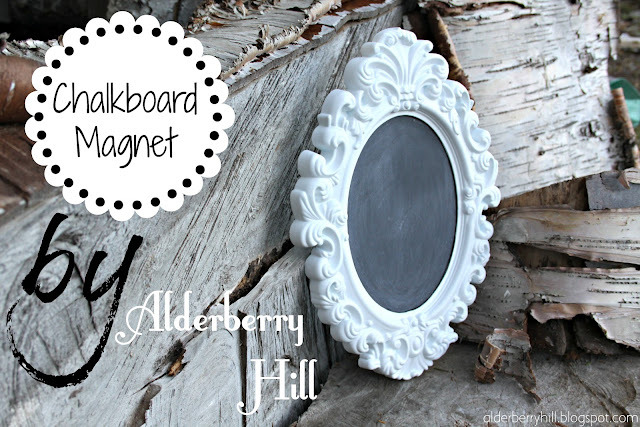 So adorable, who doesn't love chalkboards! Great idea. Chalkboards are always useful, I've upcycled tonnes of things into chalkboards. It will be great on your fridge door for a grocery list or to do list. It certainly is a beauty! Love it! Love this! I'm not very crafty, but I might try this sometime! 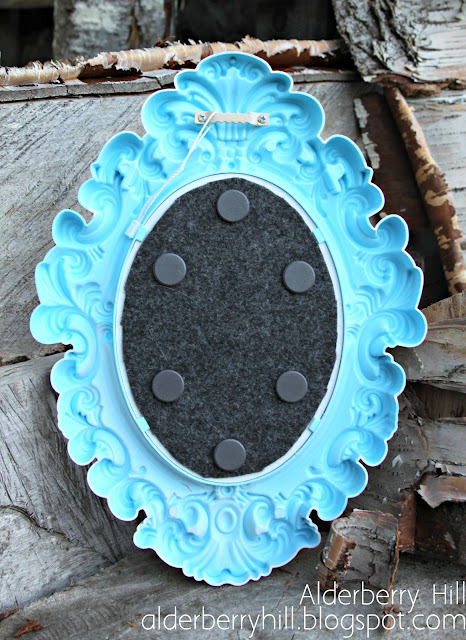 I was wondering where you purchased the turquoise mirror? This is so pretty! And such a great idea! It looks fantastic! I love it! Thanks so much for linking up on Fabulous Friday at Faith, Trust & Pixie Dust. You helped make my par-tay a success! 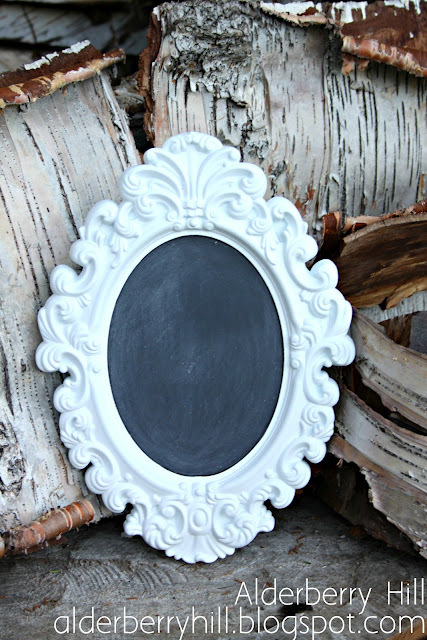 Great frame idea. Thanks for always sharing your great stuff on "I Gotta Try That" Hope you entered the giveaway while you were there. 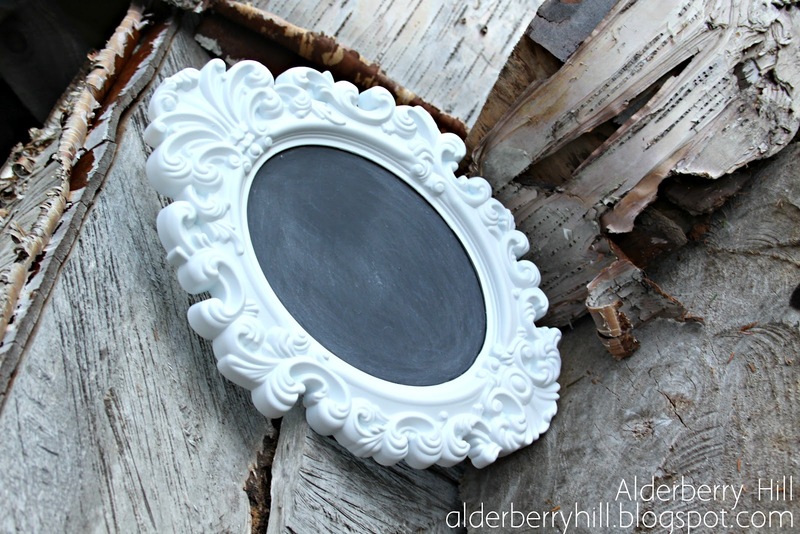 Love your frames and pumpkins! Thanks so much for sharing at the Blackberry Vine! Can't wait to see what you've got in store for this week! 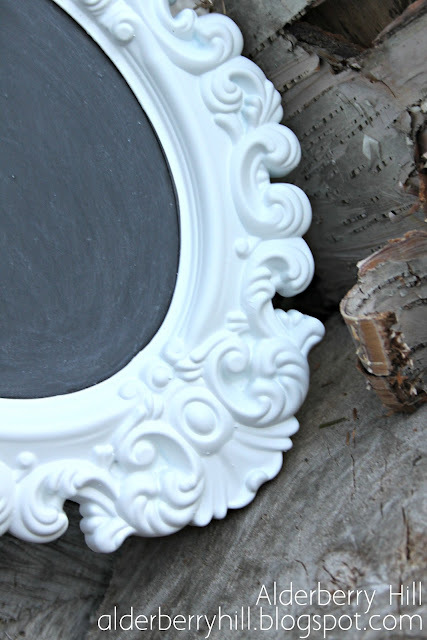 Really cute frame and chalkboard! LOVE it! I want one on my fridge!! I'm featuring this tonight at the link party! Thanks for linking up, Sarah!! This is brilliant. Love the color! Thanks for sharing on Tout It Tuesday! Hope to see you tomorrow.